Sibling rivalry seems to be starting earlier than I remember from my Marcel and Charlotte days. 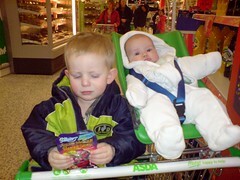 I was in Tesco with Léon and Anna in a trolley like this one today. Anna, as always, was waving her arms and legs excitedly. Léon whined a little - Anna no hit Nénaw, Anna no hurt Nénaw, Mummy Anna's hiiiiitting me! Gimme a break! I explained she was simply trying to pat him on the head because she loved him, which seemed to pacify him for an aisle or two anyway till it all started up again! I guess I should get ready for fireworks once she can crawl!